SUSPENSION & HANDLING: Class-leading 12.8 in. front suspension travel & 13 in. ground clearance, 2.5 in. king piggyback reservoir shocks, 12.9 in. rear suspension travel, four-wheel double A-arm suspension, front & rear sway bars, standard electronic power steering (EPS), color matched A-arm and springs. 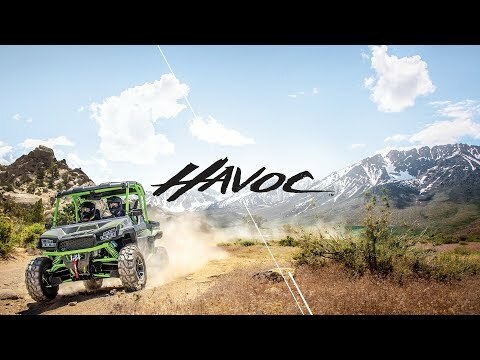 CLASS-LEADING 12.8 INCH FRONT SUSPENSION TRAVEL: Havoc hits the ground running and puts the competition in the dust. STANDARD ELECTRONIC POWER STEERING (EPS): Take complete control in any environment. POWER: Precision-tuned 100 hp EFI engine, 67 lb-ft of torque, forged internals, dry sump oil system, on-demand AWD. PRECISION-TUNED 100HP EFI ENGINE: Big-time horsepower for any challenge that tries to get in your way. ON-DEMAND AWD: Dial up more power whenever you need it. 67 LB-FT OF TORQUE: Havoc gets out of the gate with huge acceleration. HAULING & STORAGE: Class-leading 2,000-lb towing capacity, 600-lb dump bed, 24 cu-ft of storage, customizable 13.45 cu-ft extended cab. 600-LB DUMP BED: Pick up, drop off and repeat with a 600-lb bed capacity. CUSTOMIZABLE EXTENDED CAB: Havoc includes 24 cu-ft of storage and the most versatile cab in the industry. 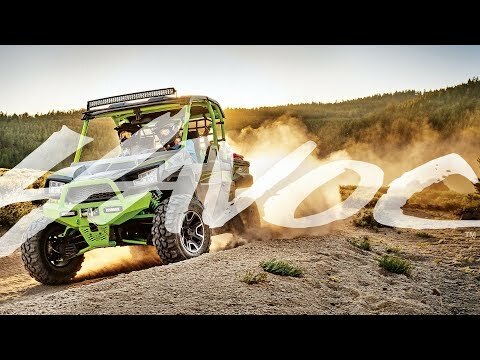 CLASS-LEADING 2,000-LB TOWING CAPACITY: If you’ve got a job to tackle, Havoc is ready for the long haul. 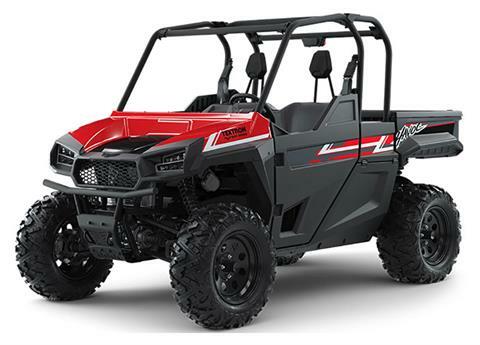 DRIVER EXPERIENCE: Aggressive fascia, grille and fender flares; class-leading 5.25-inch x 3.25-inch LCD display; 10-sq-ft opening for easy entry/exit; sport bolstered bench seat; standard hi/lo LED headlights & accent lights; standard impact-resistant full doors; standard brush guard. SPORT BOLSTERED BENCH SEAT: Enjoy more space and comfort with ergonomic seating for two. CLASS-LEADING 5.25-INCH X 3.25-INCH LCD DISPLAY: Get customizable speed control and instant feedback on fuel level, engine temperature, RPM, gear position and vehicle diagnostics. STANDARD HI/LO LED HEADLIGHTS AND LED ACCENT LIGHTS: Light up the road ahead when you’re up before the crack of dawn. RELIABILITY: Havoc is manufactured in Thief River Falls, MN, with the power, precision and performance of the Textron legacy. And we stand behind it with a rock-solid 12-month warranty.